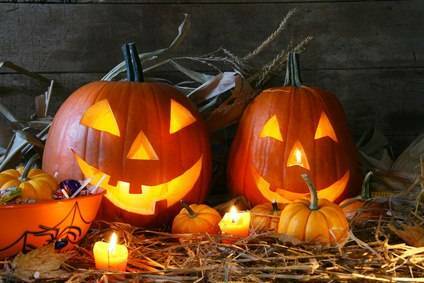 Almost everyone has made a list of their favorite Halloween goodies and treats! So before the spooky holiday comes and goes, I thought I would put one together :) Here it goes! I don't eat candy corn, but I love decorating and bathing in it. LOL This scent by Philosophy smells soooo good! It's definitely a TREAT for yourself while taking a shower. What I like about scents from Philosophy is that their scents do not linger on you after you step out of the shower. It's a really great scent and very befitting for this time of year. Also, if you're a fan of cinnamon frosting or caramel apples, they have a cute Trick or Treat body wash duo. Speaking of caramel apples! 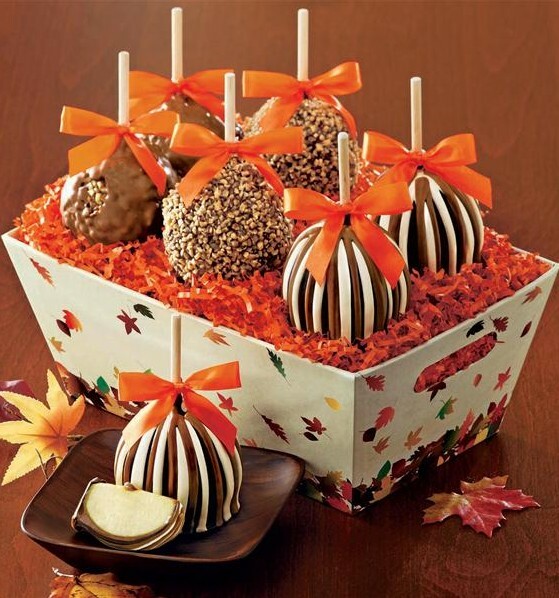 Not all caramel and chocolate covered apples are EQUAL! No, they are NOT! Mrs. Prindables has proven that! You need a really good tasting apple and equally good tasting caramel & chocolate. You guys, these are exquisite! They look good and they taste good. 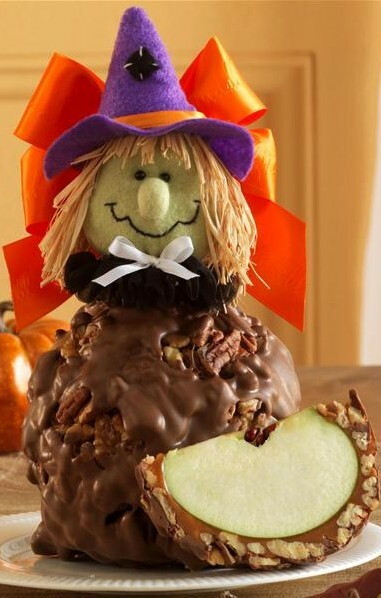 Her apples are loaded with chocolate and caramel. 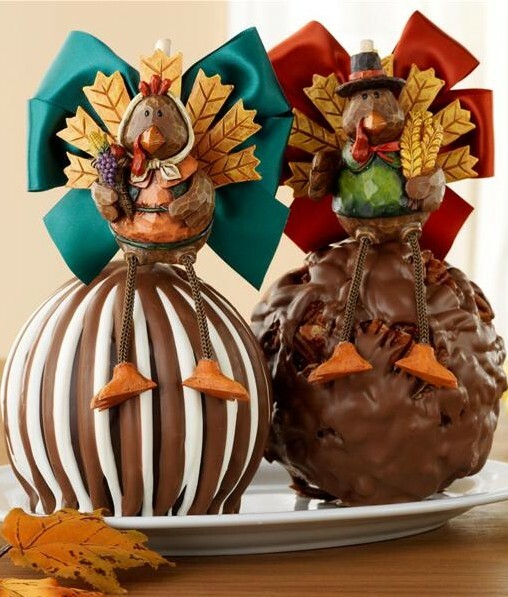 And how CUTE are the thanksgiving turkey themed apples? They show "It's The Great Pumpkin Charlie Brown" on television EVERY year! And EVERY year, I LOVE it more and more. It's classic! Great for children and anyone young at heart like me. 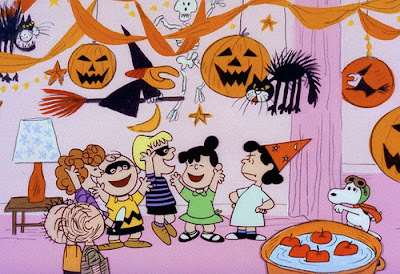 Charlie Brown was kickin' the chevron print before any of us! 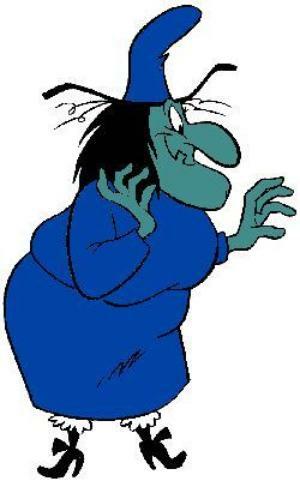 LOL Another favorite "halloween" character for me was "Witch Hazel" of Looney Tunes. Omg'd she was wacky wild! You can find all of her shenanigans on YouTube. This is simply a masterpiece. The set design, characters, songs and storyline are amazing! When you have those kind of spectacular elements you automatically have a masterpiece. I love the theater and try to go whenever possible. I'm a big fan of Wicked and love the song Freak Like Me from Spiderman. I think I adore the messages behind each! That it's ok to be different, not to judge a book by it's cover and we all have such amazing talent. For me, Michael Jackson was a genius. His creativity and imagination was just out of this world. When he remastered and remixed his original Thriller classic, I didn't think it could get any better. Boy was I wrong! I loved it. He's an artist I definitely miss from the music industry. I found and fell in love with this animation several years ago on YouTube. I thought it was so magical and whimsical. The person that put it together, really did a great job. I even love the song! I could watch this over and over. Thriller is the best and who doesnt love candy/caramel apples!? I've never seen Wicked...need to one day! Fun stuff--I still need to track down the rest of my outfit (I need cat ears!) Have a great weekend Kim! 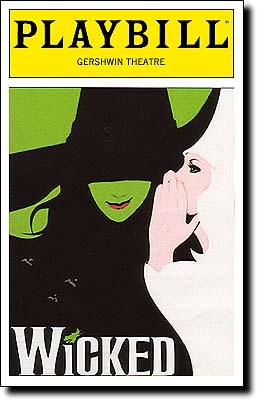 I am OBSESSED with Yankee candles and Wicked is my favorite Broadway play. What a great post! Yankee candles are the best! I love the Blueberry Pie one. My sister saw Wicked a few years ago and still raves about it. I'd love to see it! halloween is just so fun! I'm not into candy corn or caramel apples, but I do love The Nightmare Before Christmas. 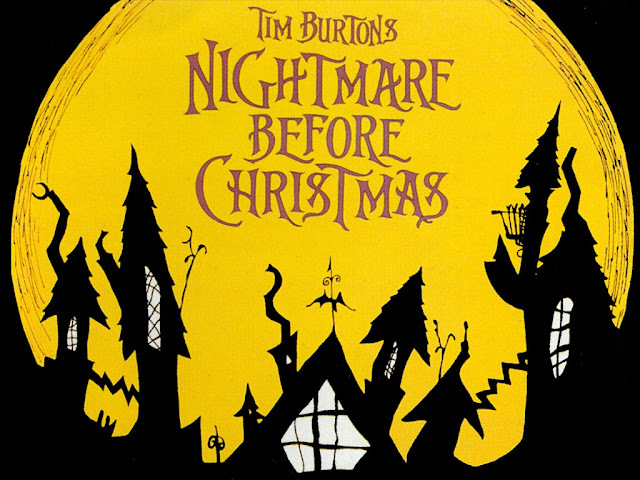 It's not even my favorite Halloween movie--it's one of my favorite movies of all time. I have to see Wicked too--that show sounds awesome. And I can't get enough of good smelling candles that reminds me of the holidays! haha..
love all of these! i gotta agree about mrs. prindables!! nothing else compares. I have been burning pumpkin butter cream all week! I love your halloween posts - still remember the one from last year! Always fantastic. You always manage to find the most awesome photos of events. Love the halloween collection. I love all the fun things in this post. I love the smells of autumn, and of course, Wicked. Such a fun post! Yankee Candles - yay, at least something we get here in Safrica, the spiced pumpkin sounds divine. 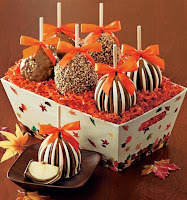 Caramel apples sound delish too, are they the same thing as toffee apples? Love this post, Kim! I love the Nightmare Before Christmas a lot!!! 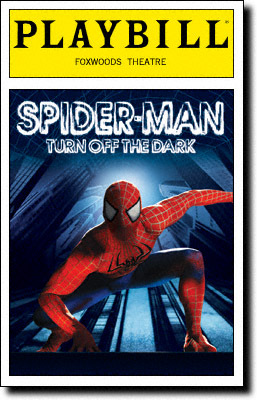 and I need to see the Spiderman Play. Kim, you're a genius! I love this post. Aww I miss MJ. amazing night it's Halloween,can't wait!! I love your blog and these french cookies are so sweet hehe! 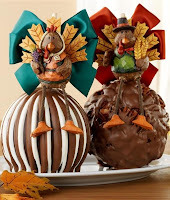 How wonderful are those candy apples? They look absolutely incredible! And can you believe I've never had a Yankee candle in my life! I need to remedy that asap! I LOVE the philosophy "halloween" line, they smell so good! I LOVE Wicked!! and those apples looks amazing! OMG, this was such a good Halloween post! I am speechless. Loved watching the videos and look at all the pictures. anything philosophy smells amazing i know - i'm obsessed! never really got candy corn though, must be an american thing, i'll have to find out what that tastes like one day! i LOVE fall candles - i already burned my pumpkin spice one through! I need to get out more cause I didn't even know about some of these yankee scents! Fall and Holiday candles are my favorites! I also love Snoopy! Awww! Happy Halloween!